In 2018, the new iPhone will be released tomorrow. Apple’s confidential work is doing very well. So far, there is no information disclosure about the new product. The only thing that can be confirmed is that one of the iPhones will be named iPhone Xs, the other two, the name of the product is still uncertain, most of the media is called iPhone XC, iPhone Xs Plus, iPhone Xs Max, iPhone 9, however, CaseMe Case accessories manufacturers announced its accessories in advance – iPhone Xs wallet case. This iPhone Xs case is the best wallet case on the market, because so far, the iPhone Xs wallet case has not appeared. It comes with 14 card slots for ID cards, credit cards or debit cards. 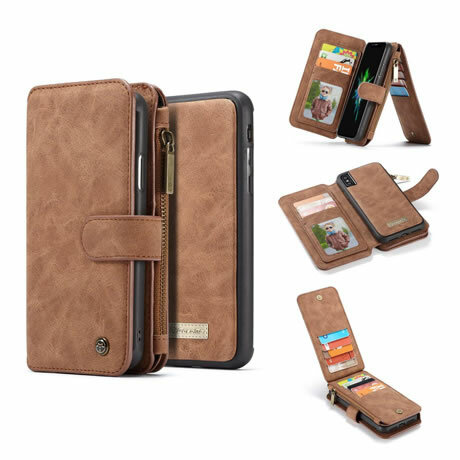 Made of soft and durable PU leather with a TPU magnetic sump for easy separation of wallets and phone cases. It also comes with a wrist strap, and when you need a hands-free, you can hang your wallet in your hand. If you are interested in several other iPhone accessories, you can see here, iPhone XC Wallet Case, iPhone Xs Max Wallet Case, iPhone 9 Wallet Case.